12: Why Dive with DiveIceland.com? Dive Iceland has been named as the top 10 Ultimate Adventures by National Geographic! We are glad to announce our new diving safari packages. As the most flexible dive operation in Iceland, we aim to fit into our customer's busy schedule. This half-day tour offers diving in Iceland's top diving destination and gets you back to Reykjavik before 3pm the same day! 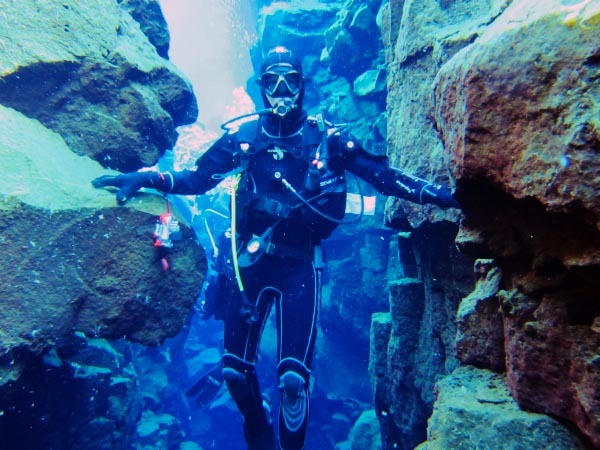 Silfra is a world top 3 diving site located in just about a hour drive from Reykjavik. Silfra is actually the ravine between the Eurasian and the American continental plates, which are drifting apart about 2 cm every year. 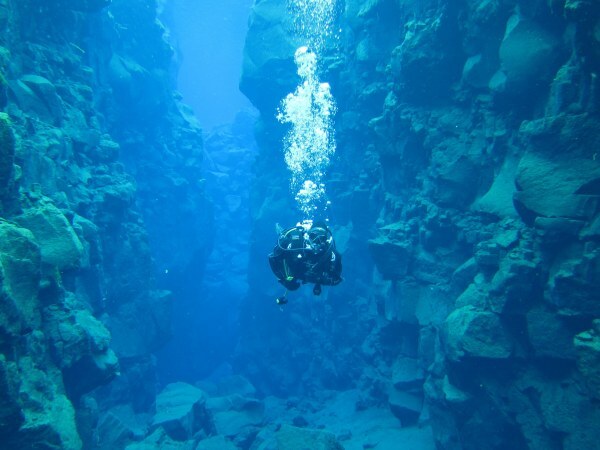 When diving Silfra you can dive from Europe to America and back as many times you like and no visas are needed. 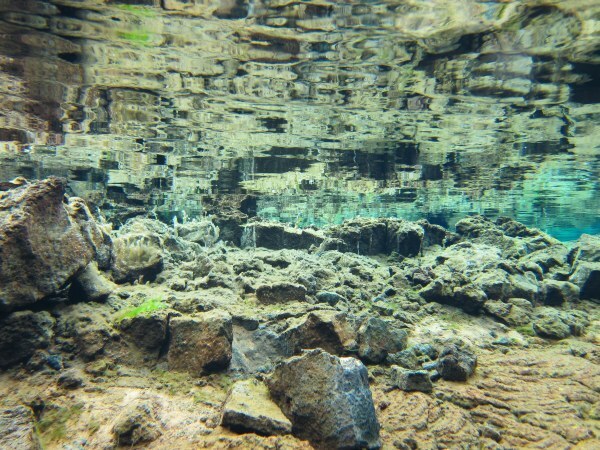 Silfra has a constant temperature of 2-4°C year round because Silfra is actually a spring coming up from underneath the lava field, after traveling for 50-100 years underground from our glaciers and going as deep as 6 kilometers into the ground. The water is about 1/3 glacier water and about 2/3 rain water. You can swim out of the ravine effortlessly because of a mild current pushing you as you dive. 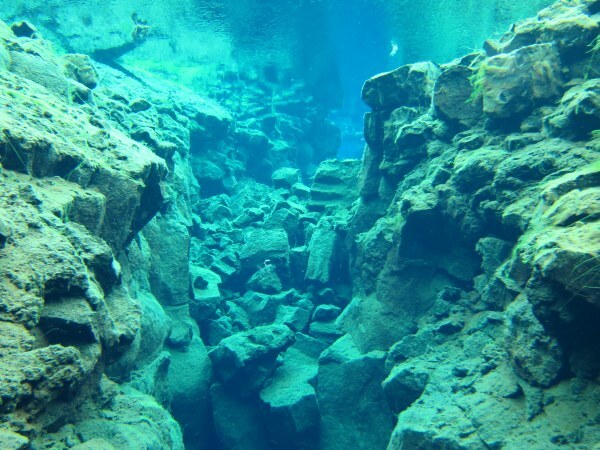 Silfra never freezes over because of the current, so we can dive it year around. Silfra offers open water diving, caving and deep diving, but the depth is about 40 meters open water and 58 meters inside a cave (we do not offer dives down to there). The maximum depth on our tours is 15 meters. Weather almost does not play any part in diving in Silfra, except it´s more beautiful in sunny weather. If we can go up there in a car, despite snow (during winter), we can dive there. Please go to our tour page or contact us, if you wish to go diving in Silfra. Over thousands of dives in Silfra, we are proud to have a 100 percent safe safety record. If you follow the guide, respect the safety briefing, and do not venture out on your own, there is no way to get lost. The best part for those that have not tried drysuit diving before or are anxious about diving in four degree water : If you have any problems, just come up to the surface! There are no strong currents and no boats, so you do not have to resolve things underwater. Come up to the surface with any problems and concerns, and our guide will take care of the rest! With the great visibility, it's hard to get lost, as long as you keep your eyes on the guide now and then! It is not often that a top diving destination is at the same time friendly towards safe, stress-free diving. Silfra is beautiful all year round and the Silfra tours are done on request all year. In the summertime from June 1st to July 15th we offer Silfra afternoon tours due to our 24 hours daylight during that time of the year. Please go to our photo gallery here on the left to see more pictures from Silfra. Contact us on info@diveiceland.com for more information or to book the tour to this amazing place. To dive in Silfra you will need to be a minimum 18 years old.